Factory fog lights cost upwards of $500. BlingLights lamps install within the factory fog lamp spots, outperform the factory lamps and cost less, guaranteed. This listing includes a complete fog lamp kit for use on the model listed in this listing without the factory fog lamps or as a replacement for existing factory fog lamps. This listing includes everything needed to install and requires no other parts or extensive modification. 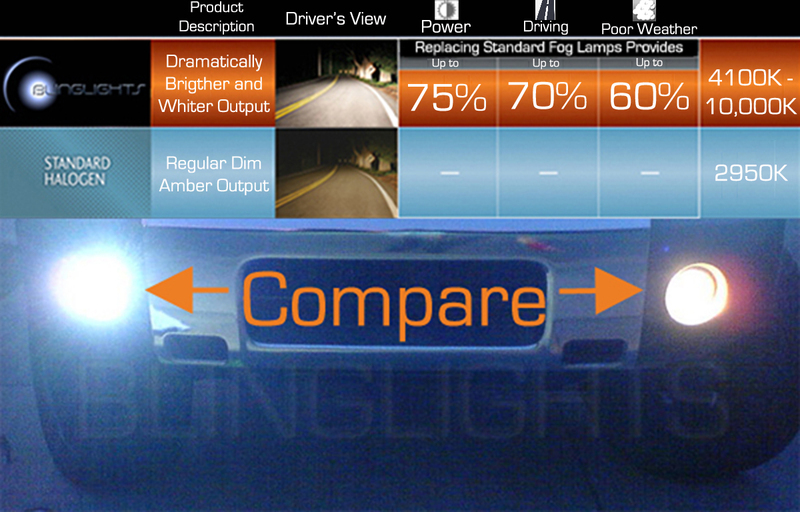 The BL-1038w outperforms regular fog and driving lights in any weather condition. 90 degree beam pattern is both wide and far reaching, die-cast metal housing 55W H3 xenon 4100K white bulbs, 2.5" lamp enclosures, heavy-duty mounting brackets, LED illuminated switch, deluxe wiring harness included. BlingLights is one of the true leaders in the lighting industry. They produce Top notch lighting equipment. BlingLights lamps stand out as "lights with attitude". Are these fog lights original equipment manufactured? No, these fog lights are manufactured by BlingLights. Many of our customers are able to install our fog light kit in a period of approximately 45 minutes to 2 hours. More involved installations may require drilling to position the lights where you want them. This kit includes mounting brackets that mount independently of the factory mounting points. The end result will be a clean look if done with care. For those uncomfortable with the install, have the kit professionally installed at a local car stereo shop. Will this kit fit my vehicle listed in the listing title? BlingLights has conducted extensive research and have sold hundreds of kits to customers with your same vehicle, with no fitment issues. Lamps are intended for installation within the factory fog lamp openings for vehicles without optional fog lights or as a direct upgrade replacement for the factory fog lights. The lights are meant to attached to the current covers within the factory fog lamp openings along the flat section similar to the factory fog lamps. Does the BL-1038w Lamp kit include everything I need? Yes, the kit includes 2 lamp enclosures, powerful H3-55 watt 4100K bulbs, fully adjustable mounts for bumper or bar, harnesses, pre-assembled wiring harness with relay and fuse, electronic switch, mounting hardware kit, installation instructions, and more. What type of bulbs come with this kit? Two powerful, genuine BlingLights H3 bulbs with an output of 55 watts a piece, 110 watts total! These bulbs are designed for maximum output and durability. The bulbs generally last many years without the need for replacement. There is a good chance the bulbs will outlast the life of the vehicle. H3 replacement bulbs are a common size bulbs and can be purchased through us or anywhere else automotive bulbs are sold. What is the BlingLights No Fault Guarantee? BlingLights will repair, or at our option, replace this product for up to 1 year from time of purchase. The NO FAULT provision of this warranty means that regardless of how the item may have been damaged or rendered unusable (fully or partially) by the Owner of the item, BlingLights will repair or replace the item without any questions being asked. To take advantage of this provision, enclose $25.00 (U.S. dollars) with the item to cover inspection, handling, and shipping. How do I pay by credit or debit card? Once the listing is over you can complete checkout by choosing payment by credit or debit card directly over the computer or phone. If there is any problems making payment contact us so we can help. Contact us directly to arrange payment by mail. What is the return policy? You are entitled to a full refund less shipping costs if item is mailed back within 10 days of receiving item. Item must be in the EXACT brand new condition it was received along with the auction item number and reason for return. Keep the hat just for trying our product even if you decide to return. Please give us opportunity to fix any problems before deciding to return. Accepted payment methods; credit or debit cards, googlecheckout, bank or cashiers check. No personal checks. All payments must be made in US dollars. thank you. Click the button below to add the 2014 2015 Jeep Grand Cherokee SRT Fog Lamps Lights Kit Xenon Foglamps Foglights Drivinglights to your wish list.